Lysdale hangar. Open seven days a week, there are many historic items on display. Among the items was a 1929 Hamilton H-47 airplane. The 4-year restoration was completed by Jack Lysdale. We also saw early Northwest Airlines memorabilia. 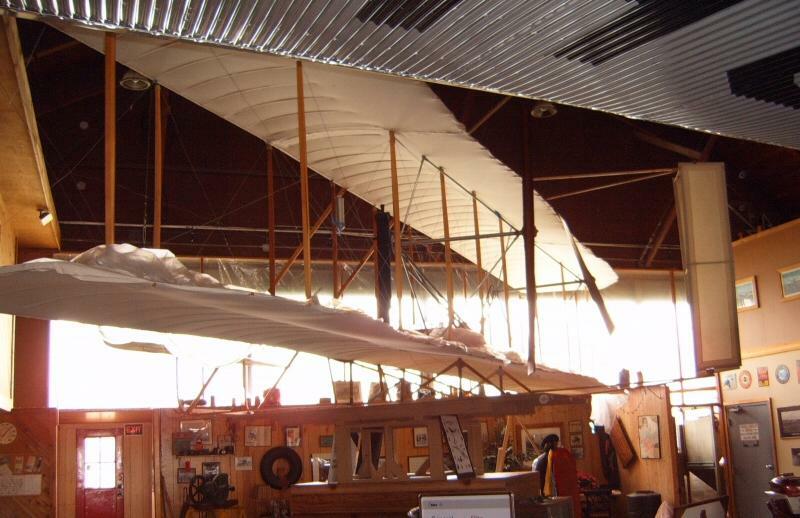 A full size replica of the Wright Brother's "Wright Flyer" is also on display. That part of the hangar houses the Minnesota Museum of Aviation and the Minnesota Aviation Hall of Fame. Jack Lysdale was inducted into the Minnesota Aviation Hall of Fame in 2004. PhotoBucket ... I took a series of photos of the elevator; plus, video of the elevator in motion in response to a model builder's requested for help. Also, another small model is captured hanging from the ceiling. Located at 1725 Henry Avenue, South St. Paul, MN Fleming Field is owned and managed by the City of South St. Paul, Minnesota. A ten minute drive from downtown St. Paul and fifteen minutes from the Mall of America in Bloomington, it is a friendly and easily accessible airport. It has a 4,001' paved runway (16/34) with pilot controlled lighting, PAPI for both runways and NDB, localizer and GPS instrument approaches. CTAF is 122.7. How does the Wright Flyer fit into the total history of Aviation? 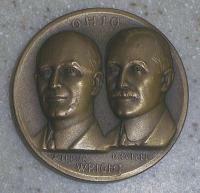 "Great American Adventurers: The Wright Brothers and the Airplane"
The original was built by Charles Taylor in 6 weeks! .... but I couldn't resist. 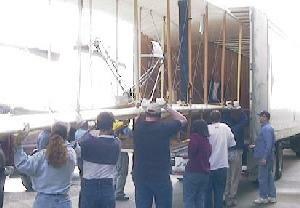 The Wright Flyer was moved to the American Wings museum but now resides in its final home at Lysdale on Fleming Field. The first public display was during D.A.D, Discover Aviation Day. Other displays of the 1903 Wright Flying include the Mall of America. Our 1903 Flyer shares space with many restored aircraft from the past. 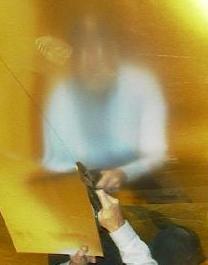 Note the white gloves in the photos. The moves generally resulted in some damage. About 14 people were required to lift the aircraft onto a special wheeled dolly. After wheeling the craft to the truck, the same crew would lift and roll the aircraft onto the truck. Due to the extremely long wing, a level, straight shot was required. 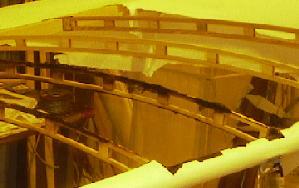 A fire at 4:00 A.M., 3/10/2003, caused considerable damage to two wing segments of the Wright Flyer. 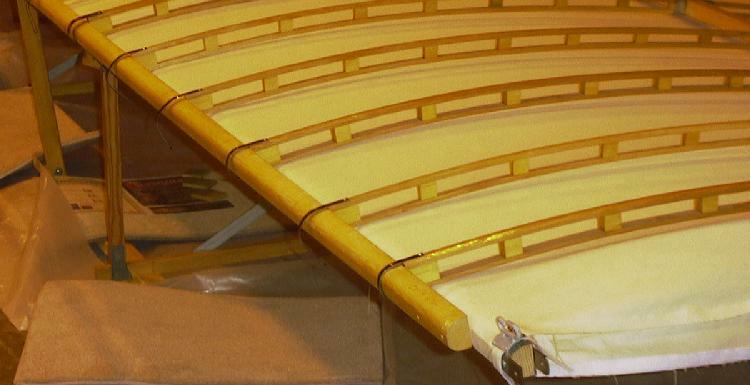 Both the upper and lower right wing segments had most of the fabric covering burned off with some damage to ribs and spars. One rib was burned through and a wing bow was burned through. Also, a fireman tripped over the rear rudder structure breaking one of the lower struts. The fire was doused by the firemen ripping the fabric off of the Flyer and tossing the burning fabric into the snow outside the hangar. Very resourceful ... eliminating any water damage. Repairs were completed quickly. 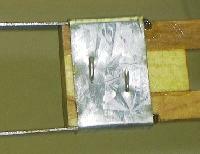 A few ribs were repaired or replace and Dale Johnson sewed two more wing envelopes out of the limited remaining supply of muslin fabric. 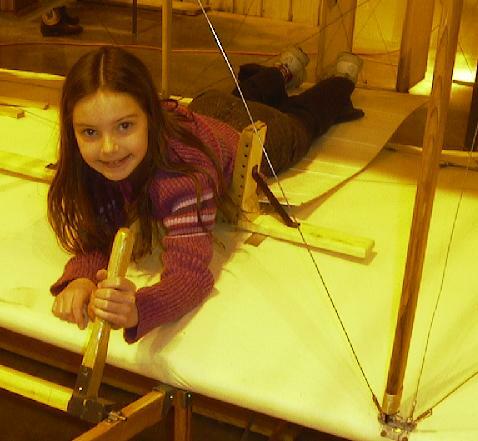 Copyright © 2002, Minnesota Wright Flyer Project, all rights reserved.